Wilmington, NC — In July, detectives with the New Hanover County Sheriff’s Office Gang Task Force raided a home and arrested three people for what they called one of the “largest seizures” of fentanyl ever made in the state. The substance found in the home tested positive using the infamously faulty field drug test kits. However, after holding the three people in prison, an actual lab test found the substance to be nothing other than sugar. “As far as we can tell this is one of the largest seizures in the state,” said NHC Sheriff Ed McMahon after the bust on July 13th. The department noted at the time that the “fentanyl” found at the home had about a $2 million street value. The standard photos were uploaded to social media of this historical bust and news agencies around the state and nation carried the story. Police say the task force executed the search warrant after tips that the three residents were selling heroin from the home. At the time, investigators said that the amount of “fentanyl” discovered in the home could have produced hundreds of thousands of bags for sale. “What we seem to be finding is the dealers are putting more of the fentanyl and less of the heroin and we believe that’s one of the main reasons we’re having people overdosing and dying on this stuff,” McMahon said. While it is certainly true that fentanyl is extremely dangerous, it was apparent that these “special conditions” couldn’t tell the difference between fentanyl and ordinary sugar. What’s more, if heroin users were purchasing this substance from the home, it was likely doing nothing to them other than spiking their blood sugar levels. In other words, police executed a search warrant, threw thee people in prison, spent a massive amount of resources, all to seize about $3 worth of sugar. As WECT reports, the false positive result can be traced to a CSI field test using a kit invented and sold by Scott Company Drug Testing to the NHC Sheriff’s Office, according to Brewer. It was not user error on the part of the CSI technician, because several samples were tested from each bag, said Brewer. 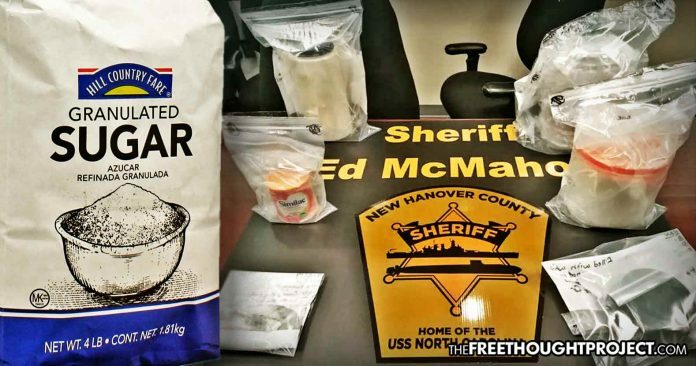 When contacted about their faulty kits, the company responded by saying that their kits can falsely identify sugar as contraband. In this instance, however, it was not ‘unlikely’ as every single test conducted on the site proved positive for fentanyl. Not only was this highly embarrassing for the sheriff’s department, but it also nearly cost thee people life in prison. Sadly, as TFTP reports on a regular basis, thousands of people are falsely imprisoned because of the use of kits like these. Just last month, we brought you the story of Rebecca Shaw, a mother of four who had never been in trouble with the law before, but ended up spending five months in jail because a field drug test falsely identified her vitamins as opioids.